I started the Military Money Manual in April 2012. In the 9 months since it started, I've seen it grow from 220 visitors per month to nearly 2000 in December. It's pretty exciting to think that 6000 people around the world have read something I've written! When you consider that there are over 3 million active and reserve military personnel in the United States, I haven't even reached 1% of my potential audience. That's not including retirees, future recruits, and military spouses and dependents! There is a lot of room for expansion in this market. I'm excited to be in it. Search traffic is definitely king for me. Google sends me 97% of my search traffic. I have to wonder if Bing and Yahoo are exaggerating their market share claims. 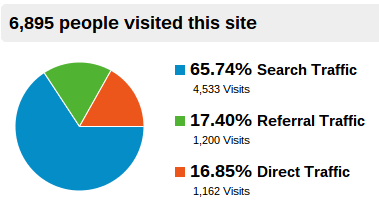 In total 1177 keywords sent traffic to my site. My most popular keywords are related to the USAA Career Starter Loan. There was very little information about this loan available before I wrote a few posts about it. The top 10 Google results were mostly web forums without a good depth of information. Now I usually rank in the top 3, with only USAA's site beating me out of the number 1 and 2 spot (as it should be, probably!). For referral traffic, reddit.com has provided the majority of the referrals. I also have a very popular comment on the Huffington Post which has sent me a few hundred viewers. I recently wrote a guest post for the Military Guide which made that site my #3 referrer. 1. Is the USAA Career Starter Loan (pre-commissioning loan) a good deal? The start of my series of posts related to the USAA Career Starter Loan. I've also talked about what I did with the loan (see #2) and how close I am to paying it off. I love this post because it shows what you can achieve when you maximize your income, minimize your expenditures, and focus on becoming debt free while still enjoying life! This post is becoming more and more popular every day. Lots of people are finding it because I used the keyword “lending club scam.” After nearly two years of using the service, I can definitely tell you it can provide a great return but it is no scam! I'm going to have to do a 2 year update soon. This post is a very practical “how to” article focused on a very specific niche: people trying to send money through the USAA Mobile app. I had to figure out how to do it myself, so I figured it would be helpful to share my experience. Income from the blog continues to grow rapidly. Because I'm using Google Adsense and they have some very draconian rules and frequently ban users, I'm just going to show the graph without any numbers. The trend is pretty clear. I went from making pennies at the beginning to making a few dollars a month to a few dollars a day in 9 months! This seems to be the experience of many other bloggers. Doug Nordman at the-military-guide.com recently wrote about his blog revenue experience over the past 3 years. Too bad I can't get these kinds of returns in the stock market or with Lending Club! If you write good, quality content, Google will find you and send traffic your way. There is money to be made online. Right now I think the ratio is about 100 pageviews = $1 for my site. More traffic = more pageviews = more money. It's not rocket science, but it is difficult to generate enough traffic to earn more than just beer money. Social media (I prefer Twitter and Facebook) is a great tool for sending traffic and building an audience. Like any business, it takes a few months to start seeing results. I'm exciting for what the 2013 has in store! (I'm already seeing a big traffic bump in the first week of January.) Lots of bloggers report that it takes 18-24 months before you see any kind of income beyond just covering your hosting costs. I won't hit that time frame until Oct 2013-Apr 2014, so plenty of time to keep writing stuff that military members find useful! The online military personal finance community is under developed. While there are 3 or 4 great sites, there is lots of room for new voices and experts. There is a lot of spammy (or scam-y) financial advice for military members out there, but a lot of it comes from corporations and organizations trying to separate you from your money. Military financial situations can be complicated and very misunderstood by the general populace. Military members deserve information custom tailored to them, written by people who have walked the walk. Here's to a great first year and to a successful 2013!